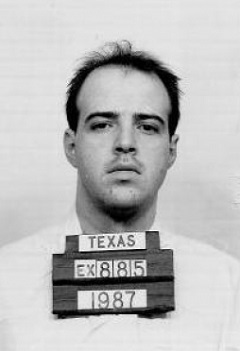 On this date in 1998, Jonathan Nobles was executed in Texas for a double murder — choked off by the lethal drugs as he sang the words “…sweetmother and child” in the Christmas hymn “Silent Night”. On parole for theft, the drug-addled former electrician Nobles broke into an Austin home on September 13, 1986 wielding a 5.5-inch knife and turned it into a scene of carnage. Nobles knifed to death two young women, 21-year-old Mitzi Nalley and 24-year-old Kelly Farquhar; when Mitzi’s boyfriend, Ron Ross, attempted to come to their aid, Nobles stabbed him 19 times. Ross survived but lost an eye in the attack. The Nobles of death row — the man who was finally executed, 12 years after the crime — was at the last a hard man to hate. He converted on death row to Catholicism, eventually becoming a lay preacher. Murder, of course, is such a great crime because in the end the loss is eternal and can never really be repaired or compensated. Nevertheless, it was clear to all those who knew him that Nobles’s remorse, his change, was deep and genuine. Mitzi Nalley’s mother, Paula Kurland, made an even more dramatic journey from the other side of that horrible night in Austin. Kurland decided that she needed to forgive her daughter’s killer in order to release the bitterness of his crime. I never wanted to ask him why. That was never important to me. What was important was that I have the opportunity to give him back the responsibility for the devastation and pain and destruction that he brought into a lot of people’s lives. I know some of you won’t believe me, but I am truly sorry for what I have done. I wish that I could undo what happened back then and bring back your loved ones, but I can’t. [to Paula Kurland] I’m sorry. I’m so sorry. I wish I could bring her back to you. [to Ron Ross] And Ron … I took so much from you. I’m sorry. I know you probably don’t want my love, but you have it. The verse he then recited from memory, the “love is …” passage of 1 Corinthians 13, is all that’s reported on Texas’s “last statements” website. Earle’s song “Over Yonder (Jonathan’s Song)” is inspired by Jonathan Nobles. * These attempts by both offender and victim to alleviate the spiritual injury inflicted by the crime exemplify restorative justice, an approach to crime and justice that emphasizes healing over punishment. You bleeding heart idiot. I knew Kelley and Mitzi. How dare you take the side of the man that brutally killed them. You make me sick. Forgiveness is a different story. If the families of the victims want to forgive this man for murdering their children-well, that is a choice they make in their own heart-so they can heal. Who the hell are you to write a song for this man? God help you-please go find a cause that is worthy or your time. Um, the Headsman didn’t write the song, he just showed the video of it being performed. And he’s not taking anyone’s side here. You are overreacting. 2/ the somewhat newer [if aging daily, not to mention exponentially] semi-demi-hemi-classic sweet child o’mine given unto our benighted earthly realm by axl rose, et al. not the same at all, not hardly. unless you have a german->english translation which has, as of now, escaped me, our reticent infant may be mild like milksop, & tender as if he were hit many times w/ a meat mallet, but, as far as i know, he [or, rather: He] was never sweet. I think it was filmed? I think I remember seeing this (if it’s what I remember, Kurland, at least at the time, was emphatically NOT an opponent of the death penalty. She still wanted the man she’d forgiven—am fighting putting that in quotation marks—to die). Of course, I could be wrong (in my memory). It’s a YouTube link so it’s safe and free from malicious viruses, etc. How would you like someone analyzing your reaction to the death of your child? Please people-he was high and butchered two young girls. If God chooses to forgive him-well that is God’s choice. No one else is really required to forgive him for this horrific nightmarish act.